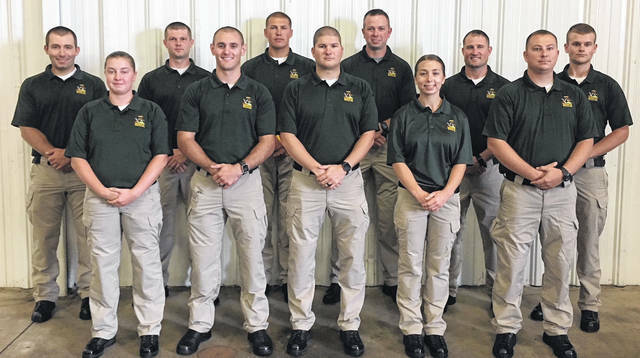 The Ohio Department of Natural Resources (ODNR) announced that the ODNR Division of Wildlife recently hired 11 cadets to become state wildlife officers. These cadets will graduate in March 2019. COLUMBUS — The 29th Ohio Wildlife Officer Cadet Training Academy began on Monday, Aug. 13, for the 11 cadets hired from a pool of more than 550 applicants. The cadets will complete more than six months of training before becoming state wildlife officers, according to the Ohio Department of Natural Resources (ODNR). https://www.mydailysentinel.com/wp-content/uploads/sites/14/2018/09/web1_New-Ohio-Wildlife-Officer-Cadets-Begin-Training_ne201896173836917.jpgThe Ohio Department of Natural Resources (ODNR) announced that the ODNR Division of Wildlife recently hired 11 cadets to become state wildlife officers. These cadets will graduate in March 2019.